[Sylvester, Lord Glenbervie and Thomas Steele, Joint Paymasters General of the Forces.] Both men's Autograph Signatures, with seals, to document witnessed by P. George Craufurd and Harry Harmood, appointing their attorneys. See the entries for Sylvester Douglas, 1st Baron Glenbervie (1743-1823), and Thomas Steele (1753-1823) in the Oxford DNB. The two men served as Joint Paymasters General of the Forces, 1801-1803. 2pp, foolscap 8vo. In good condition, lightly aged, with thin strip from mount adhering to the reverse of the leaf. Embossed tax stamp at top left of first page. The signatures of 'Thos. Steele' and 'Glenbervie' are at bottom right, with the men's seals in red wax beside them (Steele's in fair condition, and Glenbervie's lacking a segment from chipping). Witnessed at bottom left by P.
[Patrick Leigh Fermor, travel writer and soldier.] Autograph Note Signed, to 'Mr R. W. Thornton'. Kardamyli, Messenia, Greece. 13 February 1981. [Martin Farquhar Tupper on spiritualism: 'These things are true, however ridiculous' .] Autograph Letter Signed ('Martin F. Tupper.') to P. P. Alexander, praising his booklet on 'Spiritualism', with reference to Sir William Crookes. Cecil House, Eastbourne. 11 January 1872. 3pp., 12mo. Bifolium with mourning border. In good condition, lightly aged and worn. The subject of the letter is the 1871 Edinburgh reprint of Alexander's Cornhill magazine article 'Spiritualism: A Narrative with a Discussion'; with reference to the future Sir William Crookes, whose articles on the subject in the Quarterly Journal of Science would be collected in the 1874 pamphlet 'Researches in the Phenomena of Spiritualism'. [ Patrick Barrow, composer and conductor. ] Autograph Letter Signed, a letter of condolence to the widow of fellow-composer Herman Finck, praising Finck as a man and a musician. 24 Tangier Road, Richmond, Surrey. 22 April 1939. 1p., 4to. In good condition, lightly aged. He only met Finck on a few occasions, but offers his condolences 'as a Composer of Light Music, and as a former Director of Music at a West End Theatre (Daly's)'. In his view, Finck 'surely had no superior in the art of giving pleasure to others, not only by his personality, but also by his pen. 32pp., 8vo. Stitched. With leaf tipped-in carrying a one-page addendum transcript of a 'Letter from His Eminence Cardinal Manning', 1887. In good condition, lightly aged and worn. In illustrated wraps printed in green and yellow, the front cover carrying an illustration of 'St. Patrick receiving the Commission at Rome from Pope Celestine I. to preach the Gospel to the Irish People'; the back cover with illustration of 'St. Patrick preaching to the Irish Chieftains at Tara'. Over the last five pages, in small type, is a 'List of Contributors'. [ Sir Patrick Abercrombie, town planner. ] Six Typed Letters Signed and one Autograph Letter Signed to W. Perry and G. K. Menzies of the Royal Society of Arts, concerning various talks given by him there. Autograph letter on letterhead of 18 Village Road, Oxton, Birkenhead; five on letterheads of Department of Civic Design, School of Architecture, University of Liverpool; one on his Abercrombie Square letterhead. 1930 (3), 1931 (2) and 1934 (2). Each letter 1p., 4to. The collection in fair condition, on aged and worn paper. Two items with the Society's stamp. The first three items from 1930, relate to the appointment of a chairman for a 'meeting in March' by Abercrombie at the Society. On 28 November he suggests the Bishop of Chichester, 'who as Dean of Canterbury worked in very close co-operation with me, or Lady Milner'. He next (11 December) suggests 'Lord Cornwallis of the Kent County Council, who is also a member of the East Kent Committee'. [ Surrealism. ] Set of twelve photographic slides, with accompanying booklet in French, of work by Ernst, Miro, Arp, Malkine, Tanguy, Dali, Giacometti, Magritte, Masson and Man Ray, to accompany Patrick Waldberg's book. In very good condition, in transparent plastic waller. Accompanied by two booklets in French, containing extensive scholarly text on each painting. From the Philip West archive. [ George Jellicoe, 2nd Earl Jellicoe. ] Two Typed Letters Signed (both 'George Jellicoe') to military historian Barrie Pitt, regarding his 'escape from Leros' in the aftermath of the Dodecanese Campaign during the Second World War. Both on his letterhead, 30 Gresham Street, London. 21 July and 24 November 1983. Both items 1p., 4to. Both in good condition, with light signs of age. ONE: 21 July 1983. A previous letter appears to have been lost, and he is 'dictating this in the country'. He begins his account: 'As far as the surrender at Leros is concerned my memory of the early events that evening is rather vague. It is very probable that I worked my way through to Brigade Headquarters with a small party consisting of Sgt. Workman, Cpl. Dryden and L/Cpl. Allen. However it would have been quite impossible to have got there by jeep as the trip involved more or less crossing the German positions. [ Sir Patrick Moore. ] Typescript, with Autograph corrections, of 13 scripts for South African radio (series title 'Into Space'), with version rewritten for publication, and four Autograph Letters Signed, and Autograph Card Signed to H. David Lloyd. Moore's correspondence on his letterhead, Farthings, 39 West Street, Selsey, Sussex. Dated between 11 November 1972 and 5 February 1973. The talks undated, but from shortly before this. Collection of eleven items. In fair condition, lightly aged and worn. ONE: Typescripts of 13 radio talks. 65pp., 4to. On loose leaves. Titles: 1, 'Our Earth in Space'; 2, 'Dreams of other Worlds'; 3, 'Rockets into Space'; 4, 'Man-made Moons'; 5, 'Man in Space'; 6, 'Space Research and Ourselves'; 7, 'Contact with the Moon'; 8, '"One small Step . . . ."'; 9, 'Space Stations and Lunar Bases'; 10, 'Mariners to Mars'; 11, 'Into the Hot Regions'; 12, 'The Grand Tour'; 13, 'Flight to the Stars'. With a few manuscript emendations by Moore in black felt-tip pen, and other editorial emendations. [ Sir Patrick Moore. ] Typescript of 13 scripts for South African radio (series title 'Into Space'), with covering note from the South African Broadcasting Corporation and copy of letter from Rhodesia Broadcasting Corporation. Moore's typescript without date or place. [Selsey, England, 1972.] The note and letter dating from 1972. ONE: Typescripts of 13 radio talks. 65pp., 4to. On loose leaves. Titles: 1, 'Our Earth in Space'; 2, 'Dreams of other Worlds'; 3, 'Rockets into Space'; 4, 'Man-made Moons'; 5, 'Man in Space'; 6, 'Space Research and Ourselves'; 7, 'Contact with the Moon'; 8, '"One small Step . . . ."'; 9, 'Space Stations and Lunar Bases'; 10, 'Mariners to Mars'; 11, 'Into the Hot Regions'; 12, 'The Grand Tour'; 13, 'Flight to the Stars'. TWO: Typed Note, signed on behalf of T. Van Heerden, Head of External Services, SABC. 16 March 1972. [Charles Stewart Parnell and the Parnell Commission.] Offprint from The Times: 'Parnellism and Crime. 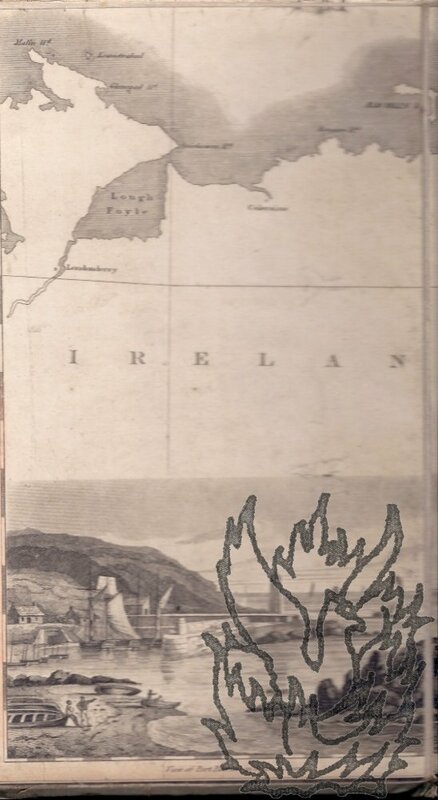 | Facsimile Page from the "Irish World." | Reprinted from The Times of June 7, 1887. London: Printed and published by George Edward Wright, at The Times office, Printing-House Square. 1887. For the context of this item see Parnell's entry in the Oxford DNB, and T. W. Moody's study 'The Times versus Parnell and Co., 1887-90' (in 'Historical Studies VI', ed. Moody; London: RKP, 1968). Moody notes that the first three Times articles (7, 10 and 14 March) 'were quickly reprinted in pamphlet form (price one penny)', but makes no mention of the present item. On both sides of single 60.5 x 47.5 cm leaf (on wove paper with 1887 watermark of 'The Times Taverham Mill'). Folded four times to make a packet with 15 x 12 cm title, which reads in full: 'Parnellism and Crime. Revised Autograph Manuscript draft of 'Cardinal Wiseman's reply to the Address of the Clergy of the Diocese of Beverley' (headed 'To the Clergy of the Diocese of Beverley'). 3pp., foolscap 8vo. On three leaves, with the reverse of the first docketed 'Cardinal Wiseman's reply to the Address of the Clergy of the Diocese of Brierley | Feb: 10th. 1851'. In fair condition, on aged paper with wear to the heads of the leaves. The address was published in the Tablet, 22 February 1851. The first page is headed 'To the Clergy of the Diocese of Beverley' and the first paragraph reads: 'My Rev. Autographs of Ian Bannen, Patrick Magee, Prunella Scales and 13 others cast members of the 1958 London production of Eugene O'Neill's 'The Iceman Cometh', with Arts Theatre Club and Winter Garden Theatre programmes, tickets, cuttings and a letter. The Arts Theatre Club, 6 and 7 Great Newport Street, WC2, and Winter Garden Theatre, Drury Lane, London. 1958. 17 items, the collection in good condition, on aged paper. Item One: Autographs of sixteen individuals associated with the production, all signing to 'Sonia'. 2pp., 12mo. On bifolium removed from ruled notebook. The signatories are: Michael Bryant, Robert Hunter, Margaret Whiting, Hilda Braid, Vivian Matalon, Tony Church ('Sonia, our proletarian beauty | from hungry Hugo'), Jack MacGowran, Robert Adams, Prunella Scales ('Maggie'), Michael Balfour ('May you triumph over virtue'), Patrick Magee, Tony Robertson, Joby Blanshard, Anthony Jacobs, Lee Montagu and Ian Bannen. The Radio Society of Great Britain, 53 Victoria Street, SW1 [London]. 'For "T. & R." Members Only.' No. 1. July 1925. 12pp., 4to. In original printed wraps. In fair condition, on aged paper, in aged wraps with chipping to extremities and spine reinforced with tape. Articles include 'The Tetrodyne' by H. Andrews, 'Circuit for Reception on 20 Metres Band' by E. J. Simmonds, 'Key Crashes', 'G2W.J. ', 'Experimental Work With Mosul'. The T. & R. Bulletin ran from 1925 to 1942. COPAC lists copies at Imperial College, Oxford, Cambridge and the British Library. From the papers of telecommunications expert Pat Hawker [John Patrick Hawker] (1923-2012). [Printed colour photographic brochure.] ABC TV in focus. ABC Television reports on: Programmes in Production. Facilities for Tomorrow. Published by ABC Promotion Department, February 1963. Westerham Press. 48pp., 4to. Profusely illustrated with 'modern' layout. Internally good, in worn covers with loss to spine. Five photographs relating to the cult series 'The Avengers' feature on five pages, including three photographs of 'Mrs Catherine Gale' (Honor Blackman), one with 'John Steed' (Patrick McNee), and two of sets (one 'a special two-tier section'). Scarce: the only copy on COPAC at the National Library of Scotland. From the J. P. Hawker papers. Typed Letter Signed ('Kilmuir') from the Lord Chancellor David Patrick Maxwell Fyfe, 1st Earl of Kilmuir [Lord Kilmuir], to the Labour peer Lord Chorley, in 'expansion' of his 'somewhat cryptic remarks' in the previous night's House of Lords debate. On House of Lords letterhead; 3 July 1956. 2pp., 4to. Very good, on lightly-aged paper. The first paragraph reads: 'In expansion of my somewhat cryptic remarks reported in col. 241 of the Official Report of last night's debate you may care to have the following note about the point which you raised.' There follow quotations relating to 'The summary offence [...] under subsection (1) of section 9 of the Vehicles (Excise) Act, 1949' and 'The indictable offence [...] under section 5 of the Perjury Act, 1911'. From the Chorley papers. Two Autograph Letters Signed ('Maurice') from writer and British Council official Maurice Cardiff to Felicity Rhodes, the first letter accompanied by a typed poem by Cardiff, and the second by an Autograph Poem by him titled 'A Winter Casualty'. The two letters both on letterheads of Stones Farm, Little Haseley, Oxford, and dated 29 May 1995 and 4 February 1996. The poems without place or date. All items in good condition. The letters on blue paper, and each in a stamped, postmarked envelope, addressed to 'Mrs Felicity Rhodes | North Lodge | 128 Banbury Road | Oxford'. Letter One (29 May 1995): 2pp., 12mo. He thanks her for typing the poem, which is 'only just the first part of a rather long one and doesn't really quite stand on its own - not that the whole thing comes off except for a few lines here and there.' he has 'never thought of having any Poems published', as he is 'only too aware of how sadly they limp along'. He has only shown them to 'one or two friends'. Valuation: Christie, Manson & Woods, 8 King Street, St James's, London. 1973. Valuation: 29pp., 4to, in a brown folder bound with green ribbon. In good condition, on lightly-aged paper. With a few manuscript additions. The title reads: 'T. DRIBERG, ESQ., 601 MOUNTJOY HOUSE, BARBICAN, LONDON, E.C.2. | VALUATIONS FOR INSURANCE | CHRISTIE, MANSON & WOODS. Typed Letter Signed and Memo from the Claims Section, British Embassy, Athens, regarding clothing and money allegedly lent to Major Patrick Leigh Fermor by Kyriakos Pattakos of Amariou. Letter addressed to Leigh Fermor from Claims Section, British Embassy, Athens. 22 October 1946. Memo without date or place. Both items in fair condition, on lightly-aged paper. The two are attached with a rusty pin, and there is a tiny hole at the head of the memo, affecting the word 'Kyriakos'. LETTER: 1p., 4to. Signature illegible. Addressed 'To: Mr. P. Leigh Fermor | British Council | ATHENS | From: Claims Section | British Embassy | ATHENS'. With 'Ref: 133/2803/109' and headed 'Subject: Force 133 Claim - Kyriakos PATTAKOS (2803)'. Requesting Leigh Fermor's 'general observations' on the enclosed memo regarding Pattakos's 'petition to H.M. Ambassador requesting payment of compensation amounting to £150/200. On House of Lords letterhead. 28 April 1955. 2pp., 12mo. 20 lines. Good, on lightly-aged paper. Asking Chorley if he would be one of '3 members for the committee which is to be set up to examine the powers of this House over its members relative to their attendance - that is probably not an accurate description of it, but I have not got the reference handy, and I think you will know what I mean!' The committee is to be appointed the following June, 'but Hendriks would be glad to have the names beforehand'. 'Wedgy Benn [William Wedgwood Benn, 1st Viscount Stansgate] and Lewis Silkin' have also been asked. From the Chorley papers. Engraved portrait of Major Patrick George Craigie, CB, from a photograph by Reinhold Thiele & Co., with anonymous printed biography of 'Major P. G. Craigie, C.B.' in 'Heywood's Authentic Series of Press Biographies', in green printed folder. The two items and the folder are all lightly-aged and in good condition. Green card folder, with 'Heywood's Authentic Series of Press Biographies. | Major P. G. Craigie, C.B.' and 'C/21' printed on front. The printed biography is 9pp., 8vo, on nine loose leaves attached to one another by a brass stud. The engraving, by Art Repro Co, from a photograph by Reinhold Thiele & Co. of Chancery Lane, is on a piece of thick paper 29 x 21 cm. Dimensions of plate 15.5 x 10.5 cm. A bearded Craigie stands in formal attire with right hand in pocket. Autograph Note Signed ('Gorman Mahon') from the Irish nationalist Charles James Patrick Mahon ['the O'Gorman Mahon'] to 'Monsieur Mermet'. Hotel D<?> [Paris? ]; 23 April 1832. 1p., 12mo. On aged and creased paper, with the second leaf of the bifolium (the lower part of which is torn away) carrying the address 'A Monsr | Monsieur. Mermet'. Reads: 'My Dear Mermet | I trust this will find you sufficiently well to enable you to come over here immediately on receipt of this from your's [sic] | [signed] Gorman Mahon | Monday Morg | 10 oClock A M. | April 23, 1832. | Hotel D<?>'. 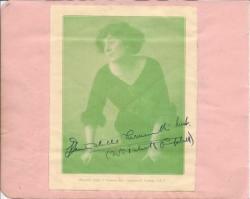 Signed photograph of Mrs Patrick Campbell (Beatrice Stella Cornwallis-West), laid down on a leaf from an autograph album which has the signature of the Czech violinist and composer Jan Kubelik on the reverse. Undated. Photograph printed by Haycock, Cadle & Graham Ltd., Camberwell, London, S.E.5'. Fair, on lightly-aged paper. The publicity photograph of Mrs Patrick Campbell, : Roughly 10.5 x 13 cm. Printed in green. Depicts her leaning forwards, with neck and forearms exposed. Across the foot she has written: 'Beatrice Stella Cornwallis West. | (Mrs. Patrick Campbell)'. 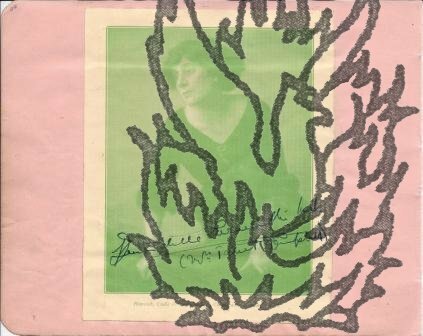 Laid down on a leaf from an autograph album, on the reverse of which is Kubelik's signature: 'jan Kubelik | 25.XI.1921'. Engraved, cloth-backed maps by Hewitt of the 'Northern Part of Scotland' and 'Southern Part of Scotland', decorated with engraved views [said to be by William Daniell] of 'the Island of Staffa' and 'Port Patrick in Wigton Shire'. In original cloth. 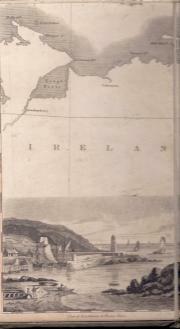 The two maps facing one another in the original green cloth binding, with that of northern Scotland to the left and of southern Scotland to the right. Each map consisting of eight 25 x 15 cm panels, each of two rows of four panels each. Printed in black, with additional lines in red and blue. Worn and aged, but in fair condition overal, clear and complete. Small armorial stamp in gilt on front board, and in ink on reverse of one of the maps. Autograph Letter Signed ('G. F. Hamilton') to 'My dear Harmsworth' (Viscount Northcliffe?). With a copy of his booklet translation: 'In St. Patrick's Praise: The Hymn of St. Secundinus (Sechnall)'. Letter dated 13 March 1919; on letterhead of the Rectory, Moylough, Co. Galway. Booklet: Dublin: The Church of Ireland Printing and Publishing Co., Ltd., 61 Middle Abbey Street. Letter: 12mo, 1 p. Good, on lightly-aged paper. Begins 'Your hands must be full just now, judging from the Daily Papers.' He presents the 'booklet' as 'a small memento of friendship for you', and describes as 'just published by me on a hymn considered (by Bernard, Bury etc.) to be a contemporary of St. Patrick. An 11th. cent MS. containing it is in T. C. D. Library. And it is also given in a 7th. cent. MS. at Milan.' Postscript referring to an article he has sent Harmsworth, 'for which I received thanks (quite unsolicited) of the Prof. of English Literature, T.C.D. !